Prepared meatballs make these a snap to fix and cook in the slow cooker. I used Aidell's Meatballs in this recipe (pictured), but feel free to use your own favorite brand of refrigerated or frozen prepared meatballs or make your own from scratch (see below). Feel free to modify the ingredients a bit. Use your favorite brand of frozen meatballs or use homemade, and reduce or increase the hot chile peppers, depending on how much heat you like. See the tips and variations for more suggestions and an easy barbecue sauce recipe. These meatballs make a great tailgating or party dish, and they can be taken along in the slow cooker. Just plug it in and heat the meatballs up when you get to the party. In a 3 to 5-quart slow cooker, combine the meatballs with the jelly, barbecue sauce, chopped chile peppers, onion, and seasonings. Makes about 3 to 4 dozen meatball appetizers, or serve with rice for a family meal. This recipe can easily be doubled for a bigger crowd. 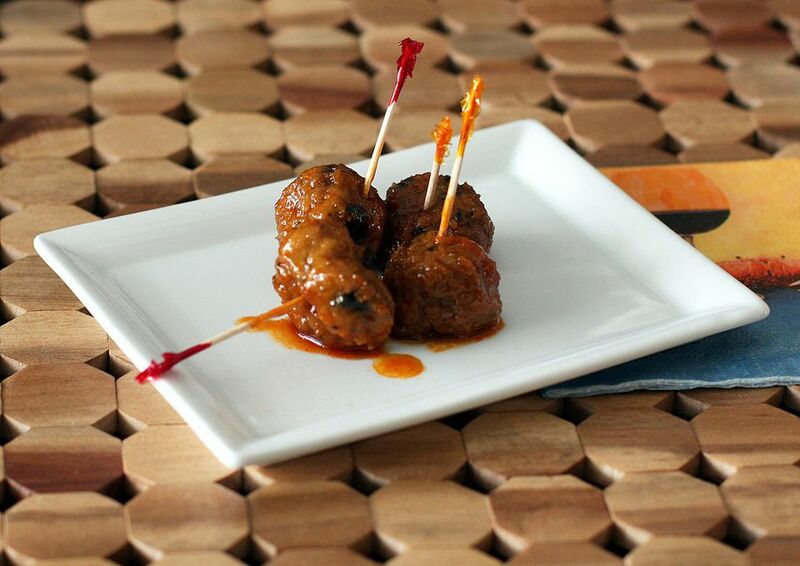 Provide toothpicks, small plates, and napkins and serve the meatballs from the slow cooker. Replace the apple jelly with a jalapeno or pepper jelly, or use apricot preserves or grape jelly. Replace the chile peppers with chopped sweet bell peppers. For even more heat add 1 minced jalapeno chile pepper. You may also serve the meatballs and barbecue sauce along with rice or use them to make sandwiches or sliders. Easy Homemade Baked Meatballs: Combine 1 pound of ground beef with 1/4 cup of fine dry bread crumbs. Add 1/4 teaspoon of salt and 1/8 teaspoon of freshly ground black pepper. Mix in 1 large beaten egg and 1/4 cup of milk. Place the meatballs on a rack in a foil-lined baking pan and bake in a preheated 350 F oven for about 30 minutes. Optional ingredients: 1/4 cup Parmesan cheese, 1 teaspoon chili powder, 1 clove minced garlic. Easy Homemade Barbecue Sauce: Combine 1 cup of ketchup with 3 tablespoons of brown sugar, 1 1/2 tablespoons of cider vinegar, 1 tablespoon of Worcestershire sauce, and 2 teaspoons of paprika. If desired, add a few drops of liquid smoke.